Every winter, I hear friends and colleagues talking about how the season seems to always come with aches and pains, and that as they’ve aged, it only seems to be getting worse. A common sentiment, for sure. As you age, you might accept pain as part of the process. And you’re not alone. In fact, I came across one statistic from the American Osteopathic Association that reports that 41% of Americans say pain is a natural part of the aging process, while almost half say that living with pain is a part of life. One of the most common forms of regular pain is neck pain. In fact, it’s the third most common type of chronic pain. Neck pain comes from a number of sources that range from poor posture, stress, looking at a smartphone for long periods of time, typing on a computer, sleeping conditions, to more serious injuries. Your job or favorite pastime may even contribute to neck pain by applying added force. The average human head weighs about 10 pounds, and each inch you move it forward adds additional weight. For example, bending your neck forward as little as 15 degrees applies 27 pounds of pressure on your neck! Sometimes, the best way to combat occasional neck pain is to use stretching and exercise. There are a few things you can do to combat the pain using both motion and isometric techniques. You don’t need to use them all; just find the ones that work for you and help loosen up the tightness and relieve the pain. Your neck moves along three planes: back and forth, up and down, and side to side. Therefore, moving your neck along these planes can help relieve pain. One motion you can try is a slow nod. Start in a neutral position with your head facing forward and your neck straight. Slowly bring your head up, so you’re looking at the ceiling; then slowly bring it down, so you’re looking at the floor. Use a slow, gentle motion and repeat this five times in each direction. I like to call the next motion the “so-so.” For this, simply start with your head in the neutral position and slowly move your head from side to side, always facing forward. Basically, pretend as if someone asked you how your dinner was and you’re using body language to say, “so-so.” Once again, repeat this movement to both sides five times. The last motion involves the slow shake. Start with your head facing to one side and slowly rotate to the other side (as if you were shaking your head “no,” but much slower). Complete this movement five times. Isometric movements are my personal favorites to relieve neck pain, and they are just as easy as the above three motions. The first isometric movement to try involves interlocking your fingers, placing them behind your head and then resting them against the back of your head. Once they are in place, start lightly pushing your head back into your hands, while slightly pushing your hands forward. Hold for 10 seconds. Next, you pull your hands in front of you, keeping your fingers interlocked, and place them on your forehead. Push your forehead into your hands, while gently adding some pushback resistance from your hands. Again, hold this for 10 seconds. You can also use the same technique for each side of your neck by placing one hand on the side of your head and pushing your head into it. Hold for 10 seconds before doing the other side. Because stress can be a major contributor to neck pain, some holistic healing methods might also be of use. Try to create a relaxing atmosphere wherever you can, using aromatherapy with scented candles and oils and calming music in the bedroom to create a relaxing environment when it’s time to rest. 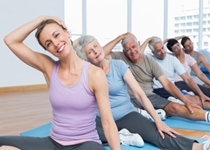 Neck pain doesn’t have to be your reality or simply a part of getting older. Give these ideas a try to see if they help. If they don’t, contact your doctor for some more information; treating your neck pain now will help you out a lot down the line. “Chronic Neck Pain Tip Sheet,” American Osteopathic Association web site; https://www.osteopathic.org/osteopathic-health/about-your-health/health-conditions-library/pain/Documents/chronic-neck-pain.pdf, last accessed February 4, 2015. Khazan, O., “What Texting Does to the Spine,” The Atlantic, November 18, 2014; http://www.theatlantic.com/health/archive/2014/11/what-texting-does-to-the-spine/382890/.